Join us for the grand opening of our new look Carriers Arms Hotel Motel Friday 12 and 13th of April. Friday night will see DJ Skweek playing from 8pm. On Saturday celebrations will continue and we will be giving away an $11,000 camper trailer in conjunction with Lion Nathan. 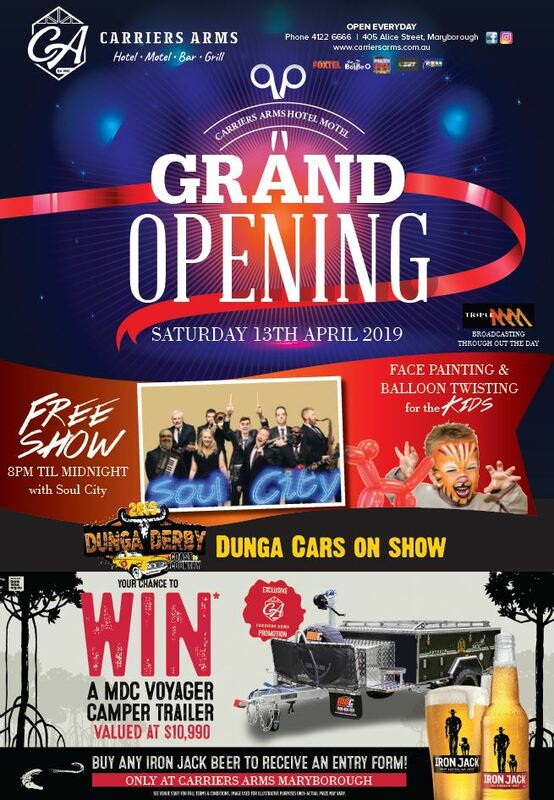 There will be face painting and balloons for the kids with Soul City playing from 8pm – midnight to entertain the crowd. Staff will be wandering around with finger food and there will be raffles to raise money for the Dunga Derby team of the Carriers.